Have you seen this warning pop up on your Mac recently? If so, do you know what it means? If not, please keep reading to find out! The original Macs from 1984 through the early 2000s all had 32-bit processors running 32-bit software. All modern Macs include powerful 64-bit processors, and macOS runs advanced 64-bit apps, which can access dramatically more memory and enable faster system performance than their older, slower siblings. The short of it: the more bits, the faster and more powerful your Mac is. So why the warning? 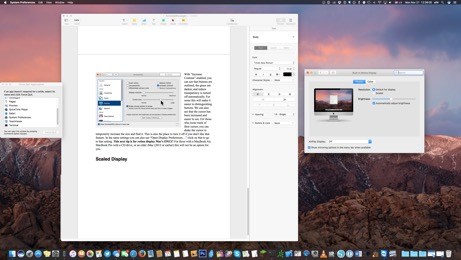 At Apple's Worldwide Developers Conference (WWDC) in June 2018, it informed software developers that macOS Mojave (10.14) will be the last version of macOS to run 32-bit apps. It is widely expected that during this year's WWDC, Apple will announce macOS 10.15 and your older, 32-bit software will NOT work anymore once you've upgraded your Mac's operating system to the new 10.15 version. Upgrade that particular software package to a 64-bit compatible version (if available, but some software packages will never be upgraded by the developer) or replace it with a competitor's offering that is 64-bit compatible. You can then install the latest Mac operating system. Not upgrade your Mac to the newest and not have the latest and greatest features of that operating system not to mention the latest in safety and security. You'll still be able to use your old software though! Consider having one Mac running the newest operating system and 64-bit programs as well as an older Mac for when you need to run those older applications on which you may rely. How do I check my Mac to see if an app is 32-bit or 64-bit? Go to the Apple menu in the top, left-hand corner of your screen -> choose About This Mac -> click the System Report button. From the system report, scroll down to Software in the sidebar, then select Applications. When you select an individual application, you will see a field titled 64-bit (Intel). "Yes" indicates 64-bit and "No" indicates 32-bit. 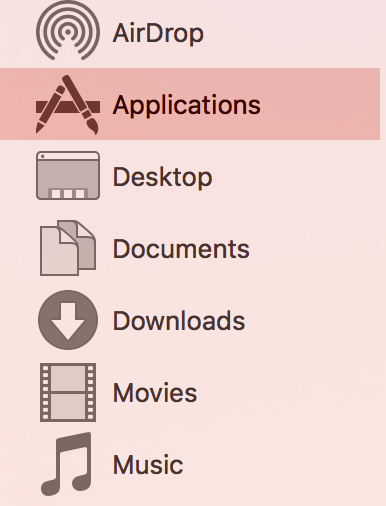 If you're using macOS Mojave, select Legacy Software in the sidebar to see all applications that have not been updated to use 64-bit processes. Encrypting a Disk on macOS 10.12 "Sierra"
A YouTube video of these instructions can be found here! Like many of my clients and friends, I use a flash drive (also known as a “USB drive” or “Pen drive” or “Thumb drive” etc. ), for backing up important files. One of the things I’ve noticed, though, is how many people put sensitive and personal data on these flash drives but don’t even bother to encrypt them. The reason it’s important to encrypt these flash drives is because these flash drives are usually physically small and can be easily misplaced, lost or stolen. If they are encrypted, you don’t have to worry about the data on them being accessible to someone that may have stolen your flash drive or happened to have found it lying around somewhere. 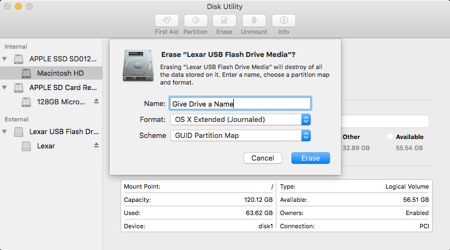 Apple’s Mac OS X 10.7 “Lion” and later operating systems make it easy to do a full disk encryption of these flash drives. You can also easily encrypt Secure Digital “SD” cards and Micro-SD cards too! SD cards are typically what is used in digital cameras to record the images taken with the camera. Most Macs have built-in SD card slots so Apple has made SD cards very easy and convenient to use. In order to encrypt a flash drive or SD card (we’ll call them “media” collectively from this point onward), you should either start with brand new media or prepare to reformat the media that you may already have. If your Mac has USB 3.0 ports (most Macs since 2012), you should use USB 3.0 compatible media for this project as on-the-fly encryption can slow down reading and writing to an external drive. Please note that when you reformat this media, you are effectively erasing it so any existing data (e.g. files, folders, programs, etc.) will be lost! If you’re using existing media, you should consider copying or backing up the data on that media to another media first so that you can then copy it back to the encrypted media later. All media seem to come from the factory formatted as FAT32 (a holdover from the old MS-DOS & Windows ’95 era) as this is a disk format that nearly all personal computers, whether they be Mac, Windows, or Linux, can read and write. 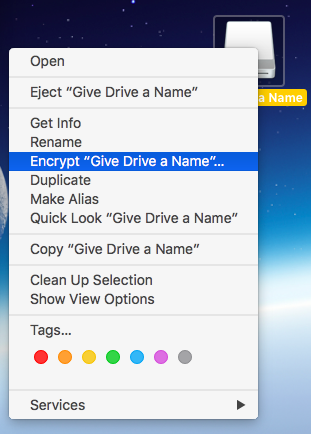 To encrypt your media, however, you’ll need to format it in a Mac specific format called, “GUID Partition Map.” In other words, you cannot easily create an encrypted disk on the Mac without first having changing the format of the drive from FAT32 to GUID. The first thing you need to do is insert the media into your Mac. Afterwards, press [COMMAND ⌘] + [SPACE BAR] to bring up Spotlight Search. 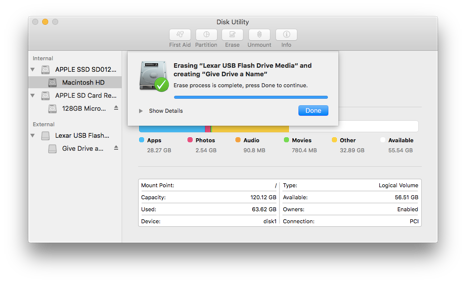 Type in DISK UTILITY and the first item highlighted should be the Disk Utility application. If it is, press, [RETURN] to select it and it will launch. Next, the Mac will prompt you to enter an encryption password before it begins the process of encrypting your media. Please remember to use a password that is not only hard for someone to figure out but one that you can easily remember. Please also note that if you cannot remember the password you used when formatting and encrypting the media, then you will not be able to access the data contained on that media ever again! You will also be given the opportunity to give yourself a “hint” on what the password is. I’d recommend writing a hint that you can figure out but would be meaningless to someone who doesn’t know you. In a minute or two, you’ll have an encrypted flash drive or SD card ready for you to use! Remember to always drag your media off your Mac’s Desktop to your Trash to eject it properly. This step helps to prevent data loss that can result by simply pulling the media out of your Mac. 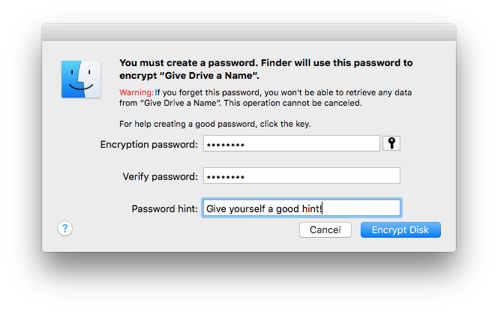 When encrypted media is plugged into your Mac, you will be prompted to enter the password you selected in order to access the data on that media. If you cannot remember your password, you can click on “Show Hint” and any hint you may have established while setting up the encrypted media will be displayed to assist you in remembering what the password is. Personally, I’d recommend that you not have the password remembered in the keychain (call/email/text me as to why!). The encrypted media can only be accessed with a Mac running Mac OS X “Lion” or later. Provided you know the password, you will be able to access the media and the data on it with any Mac running Mac OS X “Lion” (10.7), “Mountain Lion” (10.8) and “Mavericks” (10.9), “Yosemite” (10.10), “El Capitán” (10.11), and “Sierra” (10.12). The media is not compatible with Windows or any other operating system (i.e. Windows or other operating systems will not be able to access the data contained on the media). Most flash media come pre-formatted for use with PCs running Windows but your Mac can also access them. This process will make your media Mac only. It’s not a big deal unless you live or work in a mixed computing environment containing Macs and PCs. 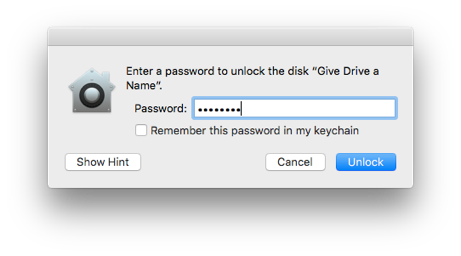 As mentioned above, you’ll need the password you selected in Disk Utility to mount and use the media on your Mac. Without it, the data on the media cannot be accessed. These drawbacks, on the whole, though, are minor when protecting your data on media that is easily misplaced, lost, or stolen, don’t you think? Give it a try and you’ll see that encrypting media on your Mac is easy to do. If it’s easy and safe, why wouldn’t you use encryption to protect your data? 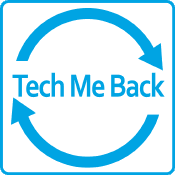 As always, Tech Me Back stands at the ready to help you with any questions you may have! Accessibility & How It Can Help You! Apple places great importance on accessibility in the design and use of its projects. It’s not just for people with disabilities but also for those who need a little help in using their products. In recent years, Apple has stressed the importance of simple, straightforward fitness goals to its clients using an iPhone and/or Apple Watch. 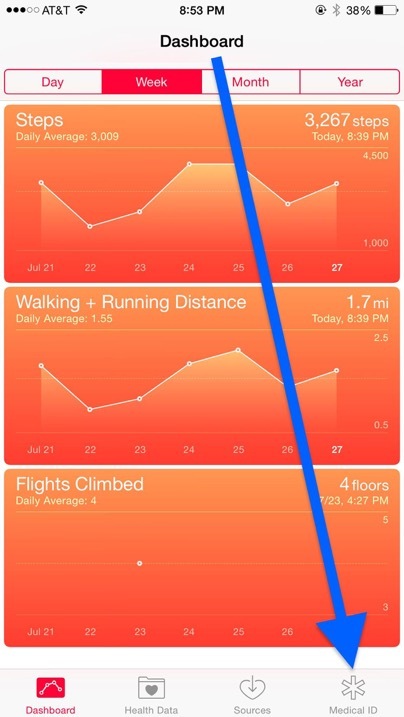 Examples include the calories expended counter, steps walked, heart rate, etc. Another one of those goals is standing up every hour during the first 12 hours in a day. The premise is that if you stand, you’re more likely to walk and get some exercise. After the Apple Watch’s initial release, Apple realized there are people who can't stand because they are bound to a wheelchair and it changed that goal from “time to stand” to “time to roll.” When you get an Apple Watch and you’re setting it up, it asks if you are in a wheelchair. It’s a small example but one that helps illustrate Apple’s growing dedication to accessibility. Unfortunately, though, accessibility features are those most often overlooked by people using their Apple devices. I recently did a presentation on Accessibility at a retirement community and it’s a topic they have yet to touch which surprised me! 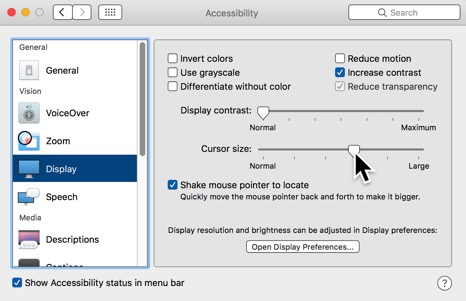 Accessibility settings are both in macOS and iOS and TV OS. Before talking a deep dive, let’s talk about an overview of what accessibility does and show a few useful settings. Accessibility is changing the display resolution, adding subtitles, or using speech to control the computer to accommodate someone with a disability or impairment. Apple has a lot of accessibility features ranging from increasing the size of the mouse cursor to using third party accessories to control the computer. We are going to focus on some of the basic settings because more advanced settings may require third party manuals. Therefore, we will focus on display, zoom, and click speed. I will provide a brief overview and options for these features but please feel free to look at other setting that may pertain to you. All of these settings are in System Preferences on the Mac or in Settings on iOS. Please note that this article will be for macOS and the next article posted will cover iOS as the settings are not universal for both. 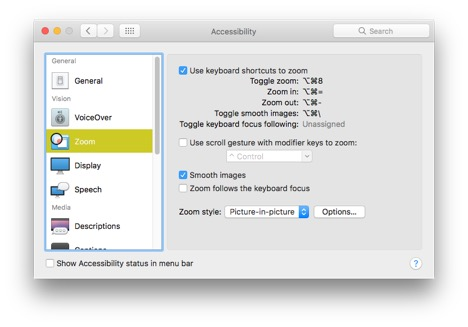 This is a quick look at the menu option for Accessibility on MacOS. Currently, I’m running macOS 10.12 “Sierra” (if you are using an older version of the Mac operating system, this may be slightly different). We will only focus on a few menus in this article. The last two options require hardware. If you know someone who uses those, please refer to their respective user manuals. 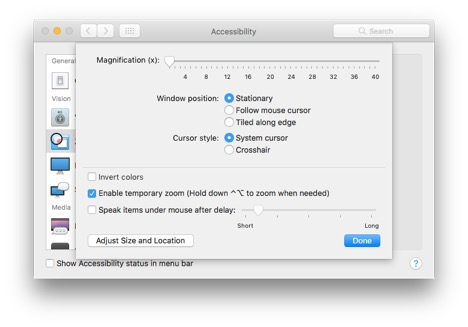 First, let’s find the Accessibility settings in macOS 10.12. In the upper left-hand corner of your screen, please click on Apple → System Preferences → Accessibility → Zoom. Display options will cover most accommodations people need when enabling accessibility options. More often than not, on a site visit, Eddy or I will usually change some settings here to make it easier to read for the client. Some options like “Invert Colors” or “Use Grayscale” are for people with more vision disabilities than we've run into but are available. The three options we change the most is “Increase contrast”, “Reduce Transparency” and “Cursor Size.” I have examples of these shown below to better illustrate the concepts. “Reduce Transparency” makes the icons in the sidebar and other interface elements easier to see. The “frosted glass” look of the menus is beautiful, but for those with a vision issue, it may be impractical. With “Increase Contrast” enabled, you can see that buttons are outlined, the grays are darker, and reduce transparency is turned off automatically. For some this will make it easier to distinguishing buttons. You can also make the cursor or arrow larger so that it’s easier to see. For those who lose track of their cursor, you can shake the cursor to temporarily increase the size and find it. This is also the place to turn it off if you don't like that feature. In the same settings you can also see “Open Display Preferences…” click on that to go to that setting. This next tip is for retina display Mac’s ONLY! For those with a MacBook Air, MacBook Pro with a CD drive, a Mac Mini on a 1080P display, or an older iMac (2013 or earlier) this will not be an option for you. Scaled display on Retina Macs can make the resolution look as if it were on a smaller or larger resolution monitor. If you select “Larger text” you will see it say “Look’s like 1600 x 900” and “More Space” will say “3200 x 1800.” Most of you reading this will avoid the extreme end of the More Space spectrum and choose larger text. Please note, that larger text means larger windows and file icon sizes. It’s scaling the display to look larger so things will change. I have an examples of scaled and default on a 5K iMac as the demo machine. Screen dimensions will be smaller on MacBooks and MacBook Pros. The first example is the “Larger Text” option. The Menu bar names are bolder and easier to see. However, Pages takes up the whole screen! You sacrifice space (i.e. screen “real estate” for size so for those who have multiple items open at a time, you might have to change your workflow. As an example, this is what the default size looks like. Notice I have three windows open side by side, but the menu bar at the top is harder to read. With the more space option, the text, icons, and windows become even smaller. However, my dock remains the same size because it’s loaded with apps. The issue many people have is double-clicking to open a file and how quick you need to be for it to work. Some people take a few tries before it registers before opening a file. 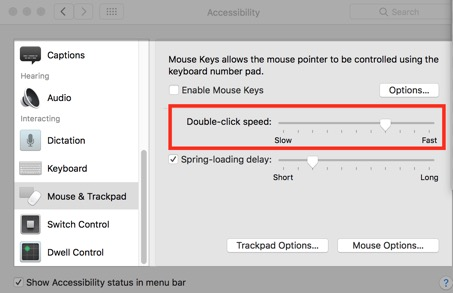 In the mouse and trackpad settings of Accessibility, this is where you can adjust the delay between clicks. By moving the slider to the left, closer to “slower,” changes the time in between click to register a double click. On the fastest setting, I even have trouble opening a folder because the required speed is so high. However, on the slowest setting, I can click, wait seconds, and click again and the folder will open. This wont affect other who may click faster than you and slow it down, but give you the opportunity to click at your own pace. There are plenty of Accessibility settings to choose from and enable that may fit your daily usage needs. This is only some of the more basic settings in Accessibility to choose from. I encourage to click through the menu’s and see if anything else pertains to you and feel free to email us about additional features. When it comes to third party accessories, please refer to your user guide. I hope this article provided some new information on an important system feature and be on the lookout for the iOS version of this article. 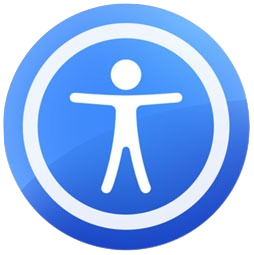 As always, should you need some assistance with the accessibility features of your Mac or iOS device, please call or email as we stand at the ready to help! 3D Touch - Peeking & Popping! In late 2014, Apple introduced the Apple Watch, which went on sale in Spring 2015, with a feature called “Force Touch.” Later in 2015, this feature moved to the Mac, starting with the redesigned MacBook, with the “Force Touch Trackpad.” With “Force Touch,” the surface is solid and does not move, but it can detect varying degrees of pressure between a tap and a press. So on the Apple Watch, pressing harder on the screen gives you new menus and options. Pressing down on the trackpad while the cursor is over a word shows a dictionary definition. A stronger press will speed up the skip speed in a movie. What is amazing about this technology is that when the computer is off, the trackpad doesn't move. It uses “haptic feedback,” where a linear actuator generates a click sensation instead of actual clicking. Apple’s original multitouch trackpads, you could only “click” by pressing down on the bottom half, because it was built similar to a diving board. On the new “Force Touch Trackpad,” you can click anywhere and get the same feedback, even at the very top of the trackpad because the sensors detect where you click. I mention all of this to give a sense of perspective of what 3D touch, a feature very similar but a bit more advanced, will do. 3D touch was released on iPhone 6S and 6S Plus (Apple skipped the SE) and uses the pressure sensitivity to add more options and features. They call these features “peek and pop” and I’ll be honest, I think the marketing team must have taken a break that day. For the Mac users here, “peek” is like “Quick Look,” giving you a preview of a file before opening it. 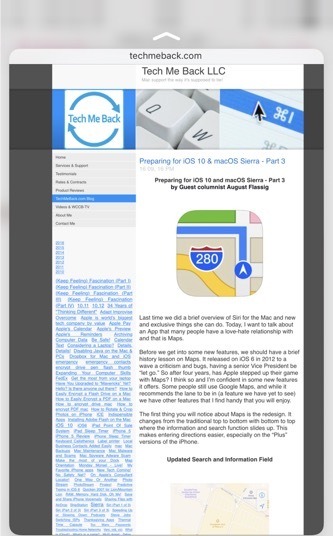 On the screenshot below, I’ve “peeked” at the contents of the Tech Me Back website, getting a preview. “Pop” is actually opening them website and I can do this by pressing into the screen. This feature becomes handy so we can stay in the current app but preview a link to somewhere else. If someone sends you their address, you can “peek” at it and see quickly where it is. This means if someone texts you an address, you won’t leave Messages, go into Maps and wait for it to load, see the address, and go back into Messages. The address is viewed quickly, while you’re still in Messages, and the conversation can continue. “Peek and pop” became the new way to preview and even respond to messages and emails. In Mail, I can preview a message (with graphic animations). The next screenshot is the message preview and the arrow pointing up indicates I have more options (Reply, Move, etc.). 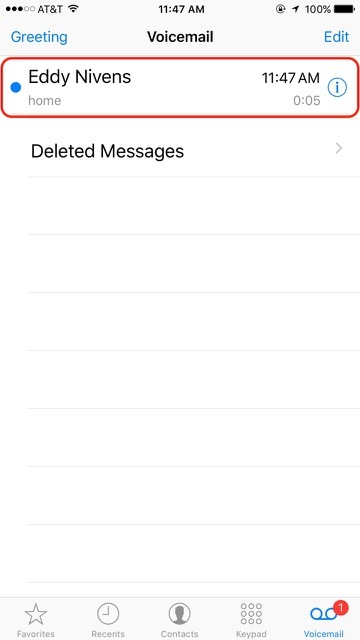 In the preview state, you can swipe left for “Read” or “Unread” or swipe right for “Delete.” These features give you the ability to look at a messages and emails without marking them as read. While using Messages, JPGs, GIFs, or other media shows in the preview. If this were a chat that I left unread, I can “Peek” into it but still have an icon reminding me to respond. 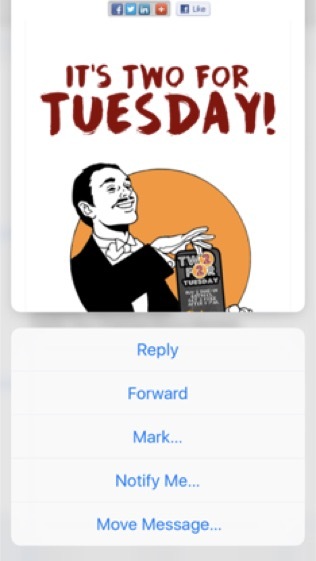 If I were to swipe up, I could get quick replies such as “Thanks”, “Thank you”, “Ok”, and “Custom.” Custom just takes you into the message to respond so it feels redundant. 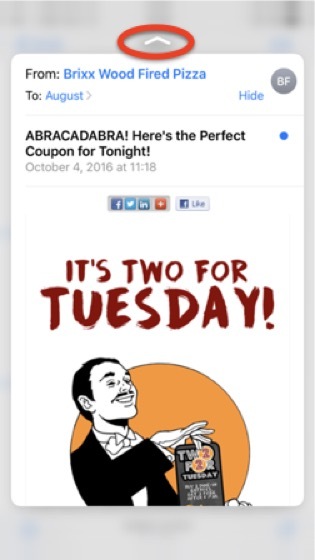 If you got a text saying “I got dinner for you” a quick reply of “Thanks” works well. At the end of the day, “Peek and Pop” feel more like a novelty more than anything else, and you would be right. Previewing pictures in Camera Roll while taking photos can be handy. Press into the Camera Roll icon (it’s a thumbnail of the last picture taken) when the camera is active and see what happens - it’s kinda cool! 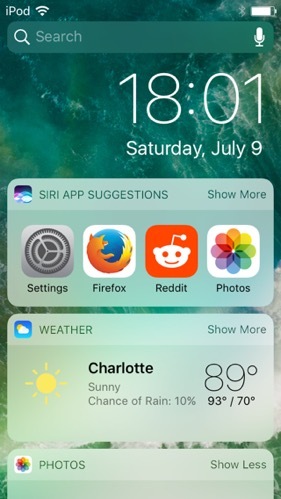 3D Touch goes beyond a basic preview. On the home screen, it’s the right click of iOS (if that app supports it). The feature of 3D Touch I love the most is getting options before opening an app. Press hard on the camera icon and get options to open with a specific mode. Press hard on the flashlight and get various brightness settings. Press hard on contacts and get quick access to your Favorites list. Not only do you get these quick menus, but if an app supports a widget, you can add that to your widgets screen, the left of the main home screen. 3D Touch is a welcome feature to give a new perspective in how we use apps. While some may find it gimmicky and rarely use it, others use it non stop. Now preview a website before I open it or click on an address to see if it’s close by. I enjoy using 3D Touch. We won’t know what iPhone 8 brings or iOS 11, but 3D Touch is here to stay and it’s evolving. I encourage you to try these new features, explore what they do, and have fun with them! See which apps you use support the quick actions or ability to add a widget. Preview a message before you open it or try a quick reply. Whatever you do, try it and see what you think. If you like it please, let us know and leave a comment. If you have questions, please give us a call. 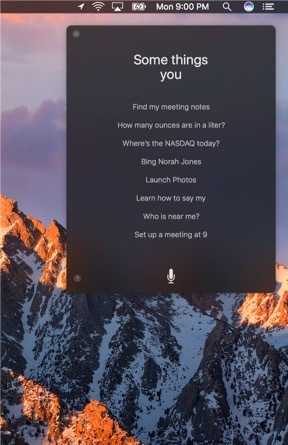 Last time we did a brief overview of Siri for the Mac and new and exclusive things she can do. Today, I want to talk about an App that many people have a love-hate relationship with and that is Maps. Before we get into some new features, we should have a brief history lesson on Maps. 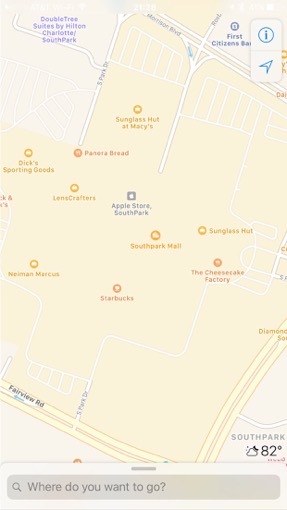 It released on iOS 6 in 2012 to a wave a criticism and bugs, having a senior Vice President be “let go.” So after four years, has Apple stepped up their game with Maps? I think so and I’m confident in some new features it offers. Some people still use Google Maps, and while it recommends the lane to be in (a feature we have yet to see) we have other features that I find handy that you will enjoy. The first thing you will notice about Maps is the redesign. It changes from the traditional top to bottom with bottom to top where the information and search function slides up. 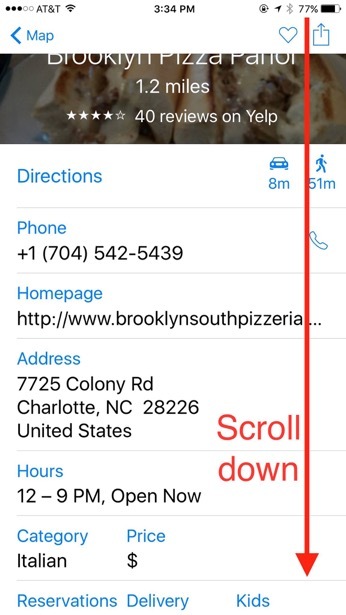 This makes entering directions easier, especially on the “Plus” versions of the iPhone. As you pan around and tap on points of interests they are large and easy to see. You can see the results field come from below revealing new information as you slide it up. When I travel to a city with friends like Wilmington, for example, we leave the car and I’ll drop a pin to remember where we parked. If we are in a hurry and I forget to drop a pin, then we hope someone remembers. in iOS 10, I don't have to drop a pin because Map’s will do it automatically! 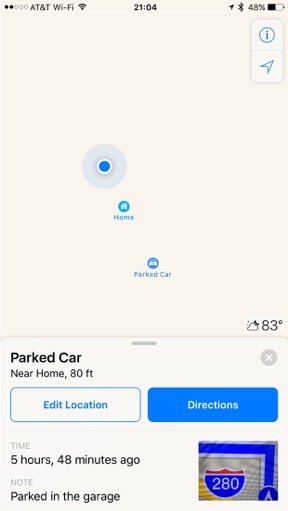 When you exit a car with CarPlay or Bluetooth, Maps automatically will remember where you parked. But that is just the beginning. You notice that I can add notes and a personal photo to help me remember. Maybe you flying out for the week and leave your car in the parking garage at the airport. Now you can add a note and a photo to help you remember where you left it. When using the iPhone as a GPS, it will only show you the distance around you in mile increments and in iOS 9, what you see on screen is what you get. Not anymore with iOS 10 with the ability to pan and zoom during real time directions! 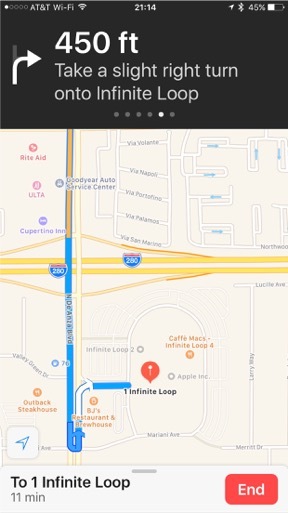 Included with those directions is traffic conditions as seen in our route to 1 Infinite Loop. The orange bar above I-280 shows traffic at the time is congested, a feature only available before starting directions. This is only a taste of what is to come in Maps and iOS 10 as a whole. Transit directions, lock screen widgets, and weather information are additional features to look out for with Maps. The look and function of these features can change up until the final release. We want to give you a heads up on what is to come later this year so you can be ready for all the changes in store. Please consider dropping me a line if this article helps you by filling out the form here. Thanks! Last time we talked about how iOS 10 removed slide to unlock and changed how we interact with iPhone on the home screen. Today, let’s talk about a feature Apple is adding to macOS Sierra, and that is Siri. The voice assistant you use to compose text messages and set timers comes to the Mac. But she does more than that, much more. 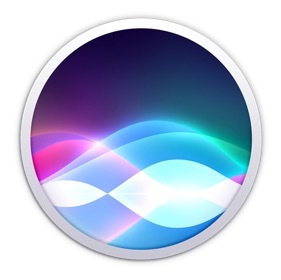 Siri can be activated by a dock icon or in the menu bar at the top of the screen. She offers up the usual suggestions like stock quotes and creating calendar entries. What makes Siri unique on the Mac is the searches are interactive. 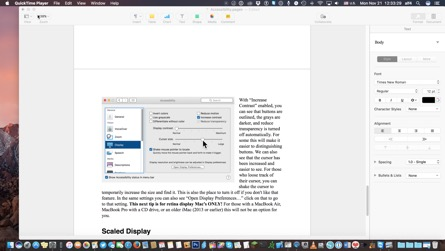 If I’m writing a document (much like this one) and I want an image from the internet, I can ask Siri “Show me Siri icons on the web.” A grid of images will appear and I can drag and drop that image into my document from Siri. Siri also works with the redone notification center by pinning results from searches (much like widgets from iOS 10 which we will cover at a later time). If I ask when the Cubs play next she will give me who they play against and when. Other things Siri can do is pin Finder search results to Notification Center. This is a small look at what Siri can do in macOS Sierra that I think will become useful for many people. From composing a message, playing a song, or looking for the right files, Siri does it all. Remember, this update will be released later this year and this is pre release information. The look and function of these features can change up until the final release. We want to give you a heads up on what is to come later this year so you can be ready for all the changes in store. Apple's new mobile operating system, iOS 10, was announced last month at WWDC (World Wide Developers Conference) and released yesterday. With that announcement comes a bunch of new changes to how you use your iPhone. At Tech Me Back, we want you to be ready for the major changes ahead. This week we will be talking about a feature that's going away with the new update that has been around since the first iPhone, and that is "slide to unlock." Touted as being a feature that prevents your phone from accidentally turning on, slide to unlock is going away and being replaced with "Press home to open." So what happens when you attempt to slide to unlock? Sliding from left to right shows the widgets/today view. Sliding right to left instantly activates the camera. This new view is available on the lock screen giving you an overview of important information. Widgets like stocks, upcoming destinations using calendar entries, transit maps, news headlines, and more. What does this mean? 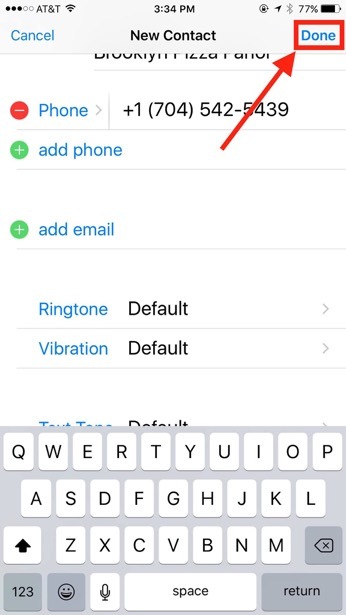 Big changes in how you get into your iPhone that will be frustrating for the first few days. You will have to break a habit you have been using since learning how to use an iPhone. This change is happening because more people are using Touch ID to access their iOS devices with the increased use of a passcode. A new feature "raise to wake" (iPhone 6S, 6S+, and SE only) will have the phone screen turn on when it detects it being picked up. This will show you notifications at a glance without pressing a button. We will continue you show new features up until the release of iOS 10 and macOS Sierra. Emergency contact information is important for everyone. The good news is that with the built-in Health app, adding emergency medical contact information to your iPhone or iPad is as simple as a few taps. This is a powerful and potentially life-saving tip! Most EMTs know where to look on an iPhone for emergency contacts but many folks don't have even set up. If you're not using Health for at least this feature, I encourage you to take a few minutes to change that. 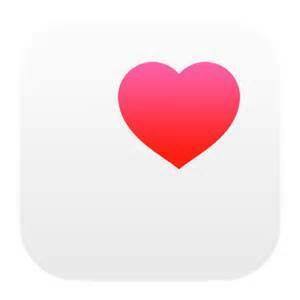 Open the Health app (white square with red heart in upper right-hand corner). 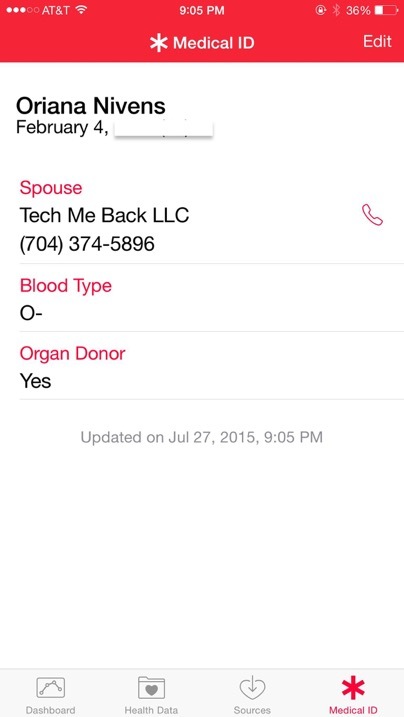 Tap Medical ID on the bottom right. 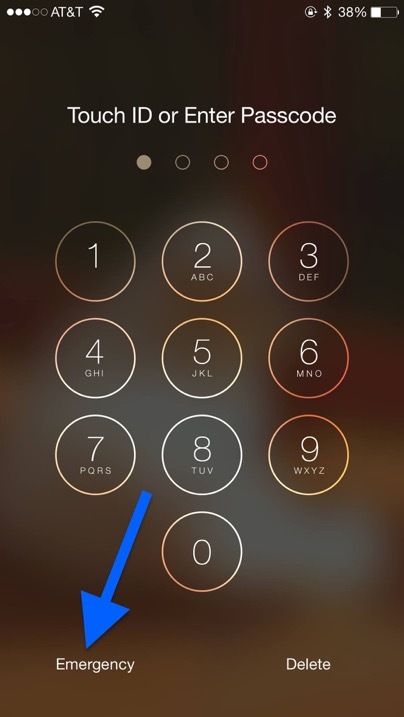 Now when you or others touch "Emergency" in the lower left corner of your lock screen, your medical details and emergency contact numbers appear as well even though the actual phone contents are locked with a passcode. If the EMT is trying to save your life, he doesn't need access to your email or photos, just your emergency contact & health information! Today I was assisting a client that is a food service provider and distributor that sends pre-packed foods via FedEx to its clients. The client wanted to replace a lone PC that was being used for printing shipping labels with a Mac to lower to her tech costs and so that everyone was on a common computing platform. The issue facing my client, though, was that she was not able to get a Zebra ZP 505 to print her 4” x 6” shipping labels correctly on a Mac from within the ShipStation web-based software she was using. If you’re not familiar with ShipStation, its “shipping solutions seamlessly integrate with all of the major eCommerce shopping carts and platforms enabling you to easily manage and ship your online orders.” ShipStation works with Amazon.com, Amazon Fulfillment, Shopify, eBay, Easy, United States Postal Service, Squarespace, Square, PayPal, UPS, FedEx, DHL, and other eCommerce shopping carts. So, if you’re running a business and you ship things to your clients, you may want to have a look at ShipStation. Anyway, I was able to get it working without any special drivers or fancy software and I wanted to post this to possibly help someone else using a Mac that might be facing this shipping dilemma! Attach the Zebra ZP 505 printer to your Mac using a USB cable. Click on the Apple at the top-left of your screen and choose System Preferences. When the System Preferences pane appears, click on Printers & Scanners in the second row from the top. The Printers & Scanners pane will open and you will see any currently configured printers in the left column. Click on the plus sign (+) in the lower-left of the left-hand column and you should see your Zebra label printer there and click once on it. 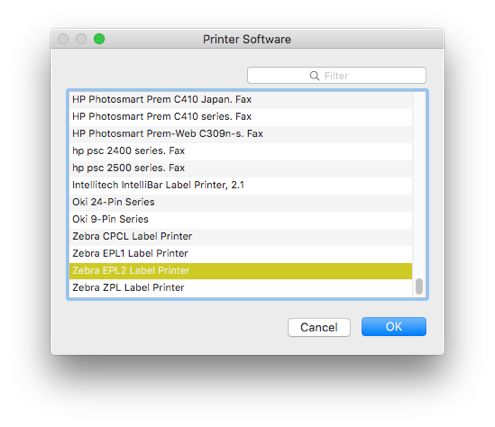 Normally, the Mac operating system will automatically pick the driver you should use but Zebra doesn’t make Mac-specific printer drivers currently but some users have created CUPS compatible printer drivers for it. CUPS is the standards-based, open source printing system developed by Apple Inc. for OS X® and other UNIX®-like operating systems. CUPS uses the Internet Printing Protocol (IPP) to support printing to local and network printers. Click on the “Use:” dropdown box and go all the way to the bottom. Choose the Zebra EPL2 Label Printer driver (see screenshot below). If I chose any other Zebra printer driver, such as the Zebra ZPL Label Printer (which I chose first as it made the most sense given the name of the actual printer itself! ), it would result in blank labels being printed. After that, you should be able to print labels to your Zebra ZP 505 label printer from SendStation directly by choosing the “Print via ShipStation Connect” option. For more information, please refer to this ShipStation Support Article. The first thing you need to do is insert the media into your Mac. 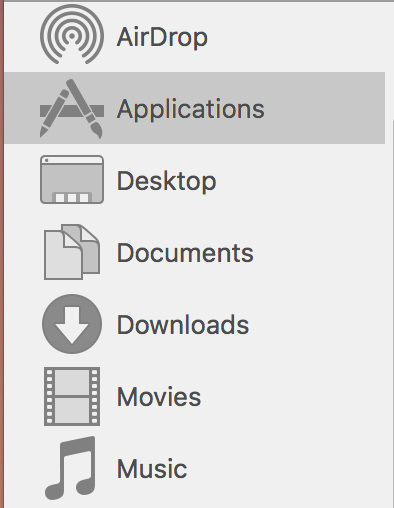 Afterwards, go to your Mac’s Applications folder and locate the Utilities folder. Inside the Utilities folder, you’ll find the Disk Utility application. Double-click on its icon to launch it. 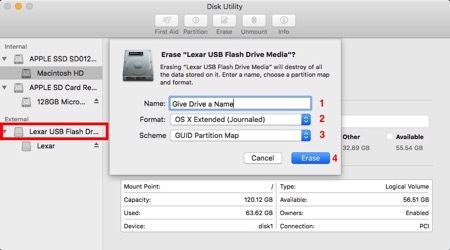 Disk Utility will show you a list of all internal and external drives connected to your Mac. Next, the Mac will prompt you to enter an encryption password before it begins the process of encrypting your media. Please remember to use a password that is not only hard for someone to figure out but one that you can easily remember. Please also note that if you cannot remember the password you used when formatting and encrypting the media, then you will not be able to access the data contained on that media. You will also be given the opportunity to give yourself a “hint” on what the password is. I’d recommend writing a hint that you can figure out but would be meaningless to someone who doesn’t know you. 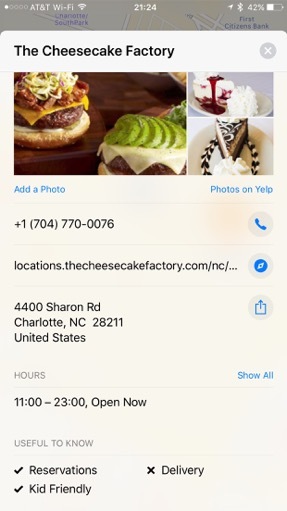 While I was out this weekend I discovered that if you use Local Search in Maps on your iPhone or iPad, you can not only locate businesses of a certain type near you, you also can save the contact cards for those businesses - directly to your Contacts. 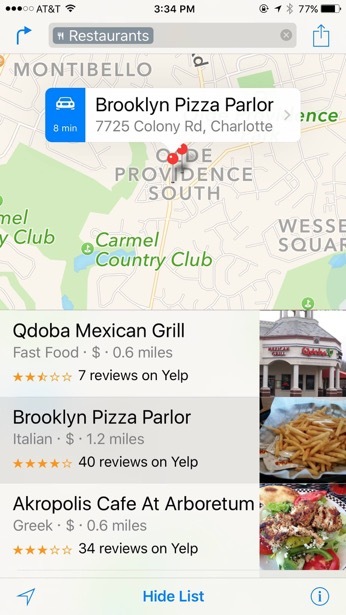 In Maps, simply search based on your location. 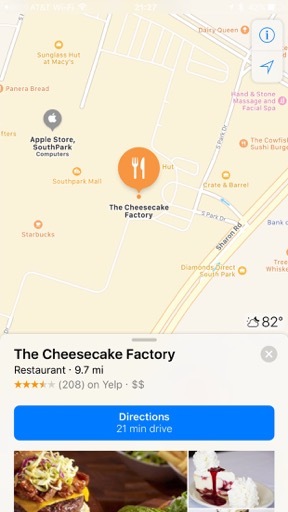 I searched for restaurants near my location at the time. When the search results appear, tap any listing to view photos, tap to dial phone numbers, get an address, find websites, see which places accept Apple Pay, get reviews, and more. 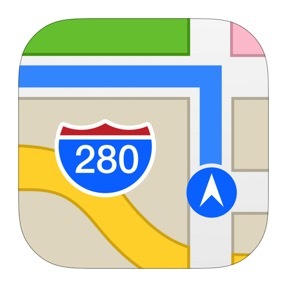 Apple also lets you tap the Quick Route button to get turn-by-turn directions. If you scroll down on the listing detail, you'll see an option to "Create a New Contact" or "Add to an Existing Contact." 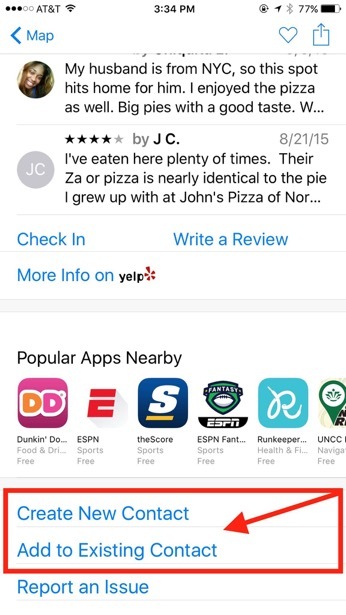 If you tap "Create a New Contact," you can save all those details - and add that great local pizza place to your phone automatically. Lastly, tap done. What a convenient way to capture a contact card! 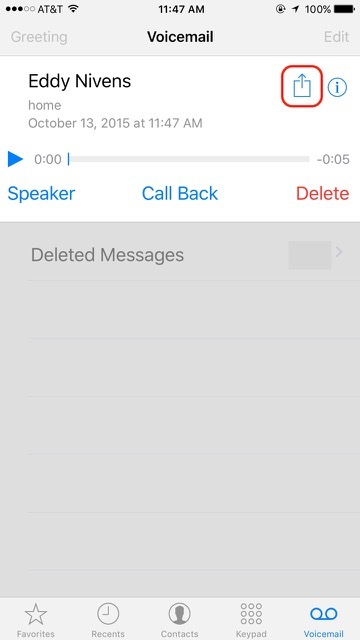 Bring up the Phone app and touch Voicemail option at the bottom right. 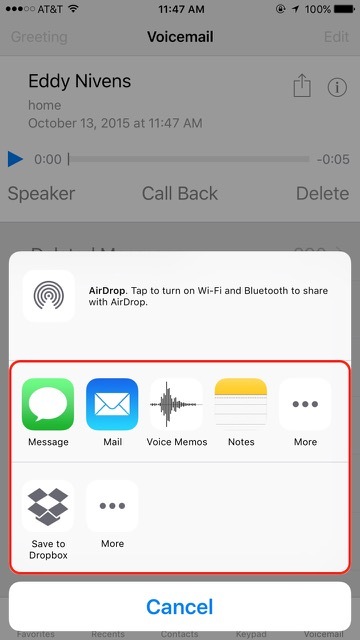 Touch the voicemail message you want to share. Share the message in whatever manner you’d like (e.g. send it via text message, email it, save it as a voice memo, put it in Notes, save it to Dropbox, etc.). Any iOS app that supports .m4a files can play these voicemails. That’s it - enjoy!